"Singer, songwriter, and multi-instrumentalist Gregory Paul has never been the type of artist easily pigeonholed into a particular sound. His various projects have run the gambit from college acoustic rock to shoegaze and experimental soundscapes to indie-rock and Americana, both in his solo works and recently with the band Autumdivers. Most recently, he’s explored the roots of his musical inspirations, participating in the old-time band The Vanish Cooks and playing guitar in the often rootsy pop band Hinkley and on his latest release, This Side of the Ground. Ironically, as he leaves the proximity of the Appalachians for the West Coast, he has embraced the Appalachian sound on his latest solo release. Mixing roots rock, folk, and old-time influences with a modern pop-based structure and a penchant for experimentation, Paul may have produced his best solo release to date, despite the difficulty in marketing such styles to his more familiar indie-rock fanbase. But neither will this be your great-grandfather’s music; Paul’s description of the album as Gothic Americana, folk-noir, and psych-folk is a better description than I could come up with. He uses banjo, guitar, bow, slide, and musical saw throughout this album, along with plenty of experimental effects and doses of keyboards or strings. The bookends of This Side of the Ground are as traditional as the music can get. Starting with the haunting sounds of a train in the distance, “O Death” is a cover of legendary bluegrass performer Ralph Stanley, and the closing “Wayfaring Stranger” is a traditional folk song known as a white spiritual. In between, we get examples of Paul’s versatility and experimentalism with both traditional and modern song structures. Gorgeously echoed guitar and Paul’s crystal smooth voice is the foundation for “Takes One to Know One,” but underneath are washes of sound, adding an almost otherworldly feel to the song. The nearly heartbreaking “Threadbare Heart” is a soft song that showcases Paul’s voice (think a cleaner Will Sheff from Okkervil River) and songwriting, and the finger-picking in the moving “Augeries” and “”House of Cards” are standout moments on the album. By contrast, “Isms” is a sweet and soft tune, riding light piano in addition to guitar and some interesting found sounds, such as fireworks exploding in the distance. Some of the most interesting songs here are the more roots-oriented tracks. On “Dusty Man,” Paul shows his finger-picking talents on the banjo and adds in the haunting sounds of cello to the background of this melancholy song. “Daisy Beach” is a rich Gothic-influenced song akin to 16 Horsepower, and “Star Crossed Again” is a quiet, folky acoustic number made special by Paul’s strong vocals. An ode to Rochester stalwart George Eastman, “Celluloid King” is a classic folk-noir number. It’s fascinating following the career of a musician with such versatility and creativity as Gregory Paul. You’re never sure what to expect next from the musician, other than perfect production and top-notch instrumentation. 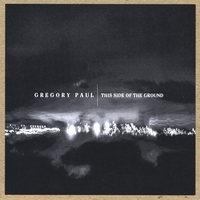 This Side of the Ground is one of my favorite Gregory Paul albums, and while it doesn’t have as much immediate marketability as some of his past releases, it showcases the skills of this artist and his love for the music that brought him here. Fans of acoustic, roots-driven music as well as experimental independent songs will surely enjoy this." Gregory Paul lures listeners through a beautifully haunted acoustic soundscape of folk-noir sounds and images...along miles of ethereal banjo, guitar, bow, slide, and musical saw. Following his popular success with the Rochester, NY based Autumdivers, Paul released his highly applauded 2005 solo album "Awake From the Flash", which contains recordings that span twenty years of GP's musical experiences. More recently, Paul's diverse musical accomplishments include fronting the experimental ensemble Inward Becomes an Anthem, and as guitarist for the old-time band, The Varnish Cooks. He is also noted for his unique banjo picking presence in Rochester's Indie-Americana band Hinkley. Paul generously collaborates with local poets, visual artists, and musicians-- and his music has been featured in a variety of multi-media projects. Gregory Paul has toured extensively throughout the US, and is currently recording work for a future release. "A hybrid of atmospheric ambience and powerful acoustics." Gregory Paul is a caretaker at one of the historic East Avenue mansions, as well a professional dog walker. "I've always loved dogs," he says. "I'm a dog person, but I can't have one where I live. Now I go out and walk dogs and get paid for it. I guess I've patched together a weird life here in Rochester." A life where he's also a photographer and singer/songwriter/guitarist. He'll be exercising that last triptych at 8 p.m. Saturday at the Gallery of Potential Life, 34 Elton St., along with 16-year-old singer-songwriter Sadie Ava. Bring a pillow, he suggests. "It's gonna be that kind of chill, sit-down-on-the-floor vibe." In the mid-'90s, Paul played guitar in Stillmotion, a fine band specializing in British shoegazer rock. Over the years, he morphed into ambient music, featuring unstructured compositions that encourage improvisation. More recently, he's explored American roots. The superb porch band he most-recently played with, the Varnish Cooks, has vanished, but he's still making music with the likes of the Dark Holler Duo, Hinkley and as a solo artist. "I guess I've got multiple personality disorder," muses the 39-year-old Paul. "There are so many good avenues to explore in music, it's hard to pick one. The trick is how to integrate that into what I do." His new album, This Side of the Ground, gives it a shot. It opens with a version of Ralph Stanley's "O Death," and closes with the old traditional "Wayfaring Stranger." That's as Americana as you get. In between, Paul's own sound weaves the Neil Young-like "Takes One to No One" with old-timey banjo, bowed guitar and modern sounds, all carrying an air of mystery. "I did integrate a bunch of, like ... I never know what to call it," he says. "Field recordings, ambient recordings. For 'O Death,' I wanted a train intro, so I went out and recorded all of these things myself. Trains, over by the tracks at Goodman Street. I went up to the Adirondacks and recorded the sounds of campfires, water and birds. There was a cricket in the basement, and I recorded it. You can hear my footsteps walking up to the cricket." And then, the footsteps stop. There is no telling crunch of exoskeleton. The cricket was not sacrificed for Paul's art. "I guess," he says, "I have kind of a Buddhist philosophy about not doing stuff like that." "This New York upstater must be a studio rat. This is his fourth LP (two are with the band Autumdivers) of making an acoustic guitar expand and shimmer into multicolor soundscape, to back and bolster his confident voice (which bears minor resemblance to Radiohead's Thom Yorke). An expert picker (see the 10-minute soft monster title track) he is equally adept at banjo, keyboards, and violin; anything to create a neo-symphonic climate for his soft-croon to swan dive into. Very, very, transporting" - Jack Rabid, Big Takeover. all the ghosts dwell there. But this isn’t old time music for dilettentes. with a most life-affirming work." "After the Regular Light set, WSPN courted the audience with a set from Gregory Paul. Still in a light haze, the audience sat down to an acoustic set by one of the members of area known rock band, Stillmotion. Paul, decked out in dim color clothing and a black pull down wool cap, looked as though he'd just come in from fishing on the coast. With only a violin to accompany him, Gregory Paul entranced the entire audience with slow, acoustic indie pop songs. With the addition of the violin, the songs seemed more in tune with a coffee house atmosphere. After a short break, Gregory Paul brought out a good old electric six-string, complete with bow, and began what can only be called a duet with his violinist. For several minutes, the two created a web of sound which lulled the audience into a euphoric semi-alert state. By crafting a field which sounded like a cross between middle eastern prayer songs and some experimental art rock, Gregory Paul enraptured the audience while still keeping a stolid countenance and space between him and those staring at him from the dark." Gregory Paul's story is probably similar to a thousand other musicians in this country. The Rochester, NY native wants nothing more than to play music, and he's been working at it for 20 years now, performing with one band or another and developing a strong solo career at the same time. He became well respected in his small city and toured regularly on the college circuit. He's even had music used in the last Winter Olympic television broadcast from his band the Autumndivers. In short, he's talented and hard working, but widespread recognition has been slow and sporadic. I've seen Paul play in Rochester a handful of times, but only recently have I come to fully appreciate the depth of this artist's talents. It was probably the Autumndivers latest modern rock take on a shoegaze sensibility of their self-titled 2004 album that sold me, and that was buoyed by some absolutely astounding solo shows as well as Paul's addition to local favorites Hinkley. While Paul has always mixed some use of guitar and vocal effects into his music, past solo efforts have leaned toward the Elliott Smith singer/songwriter approach. While those songs were good, Paul shows off a completely unique approach on Awake from the Flash, combining elements of folk, singer/songwriter, psychedelic, shoegaze, and experimentalism, while never losing his pop foundation. At the heart of his music is his acoustic guitar, with which he uses a variety of effects. It makes for a grandiose album of sweeping guitars, gorgeous vocals, and emotional beauty that I never expected. "A Walking Fire," which has a "Battle of Evermore" (Led Zeppelin) style intro but quickly overwhelms with its gorgeous vocals and guitars. The singer/songwriter side of Paul comes through on tracks like "Lost Diamond" quiet, acoustic-guitar led with haunting strings in the background, and the quietly moody "Silly Dream." And "Diver and Child" would fit nicely into the new folk movement highlighted by bands like Devendra Banhart. By contract, other tracks are more experimental, like the swirling "Burn Fast Burn Bright," which uses some nice vocal effects, looping, and sampling of sounds. It's remarkable that Gregory Paul is able to recreate the effect-laden approach on stage as well as on album, and a couple of shows accompanied by a violinist floored me with their beauty. While Paul has been appreciated on a local scale, I can only hope that a strong solo album like Awake from the Flash helps his music reach an even broader audience." Gregory Paul, the local singer/songwriter seems to be the busiest musician in Rochester. I’ve seem Paul play many times, and he always offers something different. Yet I’ve never been so completely wowed by the musician – or nearly any musician – as during his four-song, 30-minute set. Accompanied only by a violinist, Paul offered a dose of songs that made astoundingly beautiful use of effects pedals. His singer/songwriter material became some of the most lush and lovely songs I’ve heard in ages, and I found myself closing my eyes as they spiraled out, accompanied by just the right amount of echo applied to Paul’s Buckley-esque voice. While Paul’s always shown affection for the effects and layered style (see his band the Autumdivers), his solo work, which is more traditional singer/songwriter material on album, came across in that vein astoundingly well. Perhaps the only fault was that it slowed down the night before Hinkley took the stage. But you won’t hear me complaining. It was truly a beautiful sound, and I hope he brings the violinist back for future shows or recordings." "Who: Folk singer/songwriter from Rochester, who plays guitar in the band Varnish Cooks. Why check him out: Because in some of his press photos, he looks like Daniel Day Lewis' character from There Will Be Blood. And if his music was the score for that movie, it wouldn't be all that surprising. For more than 20 years, Paul has been painting images of old-school Southern and Midwest America using instruments such as acoustic guitar, the musical saw and banjo." "Singer/songwriter Gregory Paul has been recording music for 20 years now. And like the formats he has used to convey his talents - the man started out releasing cassettes (look it up) - Paul's music transcends their earthly limitations. His latest CD, "This Side Of The Ground," is bleak and haunting and stripped of any superfluous arrangements or production. Paul has been known to get out there sonically, building textures to couch his lyrical intellect. But his time it stares back with an overcast melancholy and wonder. The atmosphere is still there, and so is the hint of an underlying sadness that Paul explores acoustically with mesmerizing depth and care. Live, Gregory Paul is riveting, and this new music is unavoidable; it doesn't leave long after it's over. It will stay with you." It's an album that demands to be listened to... as opposed to just heard.